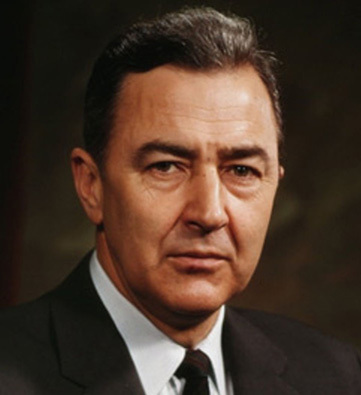 Eugene McCarthy (1916-2005) was an American politician, presidential candidate and critic of the Vietnam War. His opposition to the war split the Democratic party and helped end the presidency of Lyndon Johnson. Born in rural Minnesota, the son of a postmaster, McCarthy was educated in Catholic schools and proved an excellent student, interested in literature and history. He spent several months training for the priesthood but abandoned this plan to return to university. Graduating with a master’s degree, McCarthy spent the 1940s working as a teacher then an academic in his native Minnesota. He entered politics and was elected to the US House of Representatives (1948) and the Senate (1952). In the early 1960s, McCarthy became a prominent voice on foreign policy, sitting on the Senate’s Foreign Relations committee. In 1964 McCarthy voted in favour of the Gulf of Tonkin resolution, however, he considered the resolution a license for defensive action, rather than a ‘blank cheque’ for war. McCarthy supported South Vietnam but he was troubled by the Johnson administration’s subsequent policies, including its bombing of North Vietnam and the landing of American combat troops. In 1967 the Democratic party’s anti-war faction, headed by Allard Lowenstein, convinced McCarthy to run as a presidential candidate against Johnson. Announcing his candidacy, McCarthy told reports that “the [Johnson] administration seems to have set no limit to the price it is willing to pay for military victory” in Vietnam. If elected, McCarthy said, he would withdraw American forces and seek a negotiated peace with North Vietnam and the Viet Cong. McCarthy became the darling of the anti-war movement. His candidacy was supported by some high profile celebrities including playwright Neil Simon, Hollywood actors Paul Newman and Tony Randall, and the singing trio Peter Paul and Mary. Few pundits gave the idealistic McCarthy any chance of winning the presidential nomination, however, his opposition to the war in Vietnam split the Democratic party. McCarthy’s prospects were greatly improved by the Tet Offensive, which exposed the Johnson administration’s lack of progress in Vietnam. In March 1968 McCarthy lost the New Hampshire primary to Johnson but still won 42 percent of the vote. This result prompted Robert F. Kennedy to enter the presidential race, while Johnson, sensing the tide was against him, decided not to stand for re-election. In August 1968 McCarthy lost the Democratic nomination to Johnson’s vice president, Hubert Humphrey, who ultimately lost the presidential election to Richard Nixon. McCarthy retired from the Senate in 1970 but stood again for the presidency, this time as an independent, in 1976 and 1988. J. Llewellyn & S. Thompson, “Eugene McCarthy”, Alpha History, accessed [today’s date], https://alphahistory.com/vietnamwar/eugene-mccarthy/.